Updated Tuesday June 20, 2017 by Tom Deloge. REMINDER: Football registration will be in May. 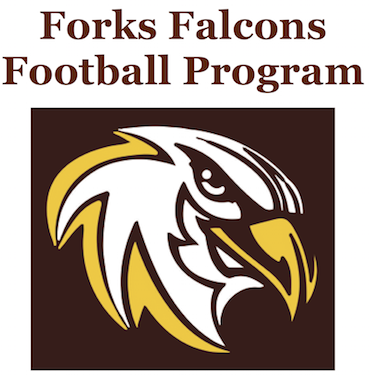 Beginning at age 5, Forks Youth may participate in the Forks Falcons Football Program. The Forks Football Program is governed by the bylaws of the Eastern Pennsylvania Youth Football League. Every head coach must be certified through the National Youth Sports Coaches Association or USA Football. Assistant coaches are encouraged to be certified. Forks Falcons utilize resources from USA Football to focus on player safety. 2. The Flag and Junior Pee Wee teams will be known as instructional level play. 3. The Pee Wee, Junior Varsity and Varsity teams will be known as competitive level play. B. All players must make weight at the designated starting level by the third game of the regular season or move up to the next higher weight class. Each player will receive a one (1) pound per week weight allowance starting in Week 4 with a maximum of five (5) pound total increase by the end of the regular season. There will be no weight allowance for any player who qualifies under the Older but Lighter rule. 1. There will be no exchanging of players that do no meet the designated weekly weight. Should this issue becomes known, it will be investigated by the Advisory Committee. 2. Opposing coaches at all levels will be responsible for reporting players that did not make weight so that honesty can be maintained throughout the league. C. No Player at the flag level may attain his 8th birthday prior to August 1st of that year. D. No Player on the Junior Pee Wee team may attain his 9th birthday prior to August 1st of that year. The player must weigh 80lbs. or less to play at this level. E. No Player on the Pee Wee team may attain his 10th birthday prior to August 1st of that year. The player must weigh 100lbs. or less to play at this level. F. No Player on the Junior Varsity team may attain his 11th birthday prior to August 1st of that year. The player must weigh 120lbs. or less to play at this level with the listed age in the first sentence of letter F.
1. A player who turns age eleven (11) years between August 1st of the previous year and July 31st of the current year is eligible to play on the Junior Varsity level team as long as he/she weighs 85lbs. or less. G. No Player on the Varsity team may attain his 13th birthday prior to January 1st of the current year. The player must weigh 140lbs. or less to play at this level. 1. A player who turned age 13 years between January 1st and July 31st of the current year is eligible to play on the Varsity level team as long as he/she weighs 115lbs. or less. 2. Any person who turns age 14 years from January 1st through December 31st of the current year is ineligible to play as they are too old for this league. H. Any by-law changes to the age and weight structure must remain in effect for a minimum of two years.